Over at Download the Universe, the science ebook review, I have a new article about one way that well-intentioned science journalism can go very, very wrong. 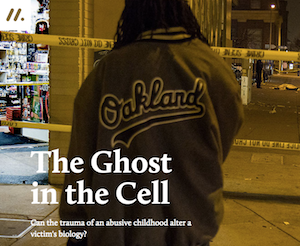 The trouble starts when Scott Johnson, author of an essay called "Ghost in the Cell," tries to write about two extremely complicated issues — violence and epigenetics — without acknowledging that there is any complexity involved. And the trouble gets worse when he decides to cast an African-American woman in Oakland, CA, as the perfect example of the "kind of person" who might have a genetic predisposition to violent behavior. It's a prize that scientists have sought since the early nineteenth century: a biological marker that predicts violent behavior in humans. In the 1830s, phrenologists believed head bumps could reveal a criminal personality — often, prostitutes and the poor were said to have bumps that marked them as deviants from birth. But today, it seems this pursuit may have moved beyond the realm of pseudoscience. Read the rest over at Download the Universe.